Two bone in ribeye steaks. Cowboy cut ribeye is a very thick cut of ribeye that still has the bone in the meat. Ribeyes are well-marbled with fat rather than gristle, resulting in a more tender steak with a large flavor profile. 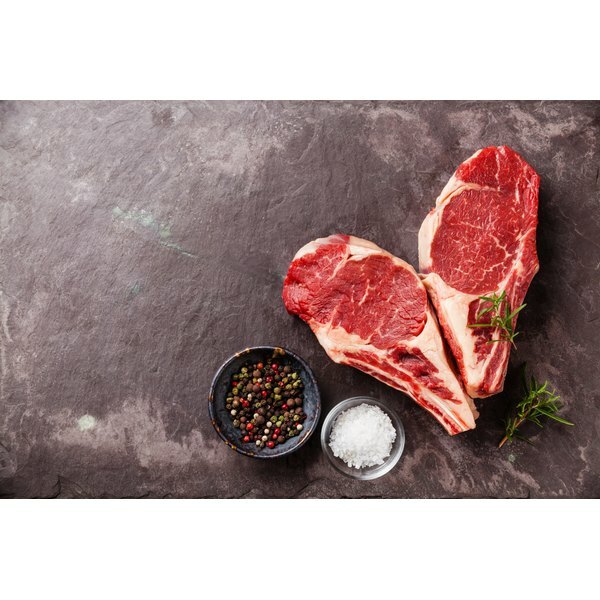 Ribeye steaks are full of protein and niacin. This cut of beef also contains B vitamins and zinc. Enjoy the cowboy cut ribeye in moderation because it is high in saturated fat. A 4-oz. serving of ribeye steak contains roughly 5.6 g of saturated fat. Preheat the gas grill to 425 degrees Fahrenheit. Wash the steaks off with cold water and set them on a plate. Season both sides of the steak with salt, pepper and any other seasonings you choose. Let the steaks stand at room temperature for 30 minutes. This will allow the steaks to cook evenly throughout. Place the steaks on the grill and cook on each side for four minutes for rare, five minutes for medium-rare, seven minutes for medium and nine minutes for well-done. Remove the steaks from the grill and transfer the meat onto a plate. Cover the steaks with aluminum foil and allow the meat to rest for 10 minutes before serving to allow the juices to redistribute. Rinse the steaks under cool, running water. Season both sides of the steak with salt, pepper and other seasonings like garlic, rosemary and thyme. Heat olive oil in a skillet to medium-high heat. Carefully place one seasoned steak in the oil to avoid oil splatters. Cook the steak for four minutes for rare, five minutes for medium-rare and nine minutes for well-done. Flip the steak with a pair of metal tongs. Cook the steak for the same length of time on the other side, and remove it to a serving platter. Allow the meat to rest for 10 minutes before serving. Rinse the steak under cold water. Pat the meat dry with a paper towel. Preheat the oven to broil. Rub the outside of the meat with olive oil. Season the outside of the steak with salt, pepper and other seasonings, like garlic, thyme and rosemary. Heat olive oil to medium-high heat. Place the steak in the oil and sear sides for two minutes, or until the outside is nicely browned. Place the skillet in the oven 3 inches from the heating element. Close the oven door. Broil the steak for five minutes. Flip the steak and broil it for another five minutes. This will result in a medium-rare center. What Is the Best Way to Cook Swordfish?